MANILA (AFP) – Benigno Aquino was set to be confirmed as the next Philippine president on Tuesday after steamrolling his rivals in national elections with a promise to reduce massive poverty by fighting corruption. Aquino, 50, electrified the country during a tumultuous election campaign with his mantra of clean government, following nearly a decade of rule under President Gloria Arroyo marred by allegations of enormous graft. With more than half of all votes cast counted, the bachelor had already secured just over 40 percent of the ballot, the election commission announced on Tuesday morning, placing him on track for a landslide win. His nearest rival, former president Joseph Estrada, had just 25.4 percent, giving Aquino a near insurmountable lead. Aquino is the son of the Southeast Asian nation's most revered democracy heroes, and he deftly tapped into popular sentiment for his parents by pledging a new style of clean government. His mother, Corazon Aquino, led the "People Power" revolution that overthrew dictator Ferdinand Marcos in 1986 and then served as president. His father, Benigno "Ninoy" Aquino, was shot dead in 1983 as he attempted to return from US exile to lead the democracy movement against Marcos. The bespectacled Aquino was a latecomer to the presidential race, declaring his candidacy only after his mother's death from cancer last August plunged the country into mourning and demonstrated the power of the family name. About 75 percent of the 50 million eligible voters turned up at polling stations on Monday, reflecting Filipinos' deep commitment to democracy and their desire to have a say in the country's future. But the violence that always plagues Philippine politics inevitably flared. More than 17,000 positions were at stake -- from president down to municipal council seats -- and local politicians who are infamous for using their "private armies" to eliminate rivals or intimidate voters were out in force. Ten people were killed on polling day, bringing the death toll from election-related violence over the past four months to at least 40, according to police statistics. 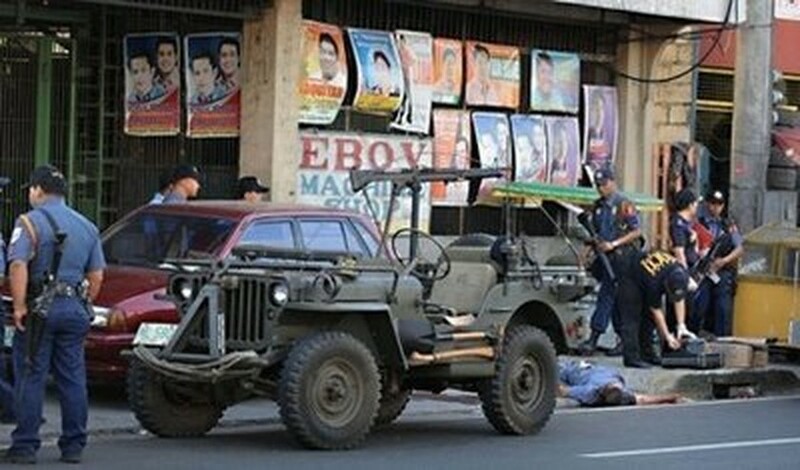 Two of the fatalities occurred as gunbattles raged in the flashpoint southern province of Maguindanao, where 57 people were killed in an election-linked massacre late last year. Technological problems also emerged immediately after polls opened with some machines breaking down, and the election commission was forced to extend the voting period by one hour as long queues formed. Nevertheless, the election commission and security chiefs insisted the country's first effort at automated polling was a huge success. "The... elections will go down in our nation's history as probably the most peaceful and orderly political exercise ever held in our land," national police director general Jesus Verzosa said. Despite glitches, analysts said Tuesday that the automation could shake up the political system by delivering quick results for Filipinos, who often had to wait weeks for the winner to be known under the old manual counting system. The computerisation reduces opportunities to manipulate the vote particularly in outlying provinces, where fake votes were stuffed into ballot boxes and tallies doctored in past elections. "The amazing thing is that we voted yesterday and this morning, we have a new president," Raul Pangalangan, a prominent commentator and legal expert from the University of the Philippines, said on local network ABS-CBN.